I’m headed to the Yucatan next Wednesday for a 12-day trip with the boyfriend before we move to sunny Seattle next month. After much wringing of hands about the optimal itinerary keeping in mind it’s low season (meaning, hotter than hell), we’re spending 4 nights/each in Tulum, then Valladolid, then Puerto Morelos. In addition to the activities I’m very excited about splashing around in freshwater cenotes arrived at by bike, exploring lesser-known Mayan ruins in Coba and Ek-Balam, floating through the Sian Ka’an Biosphere by boat, diving the colorful reef off the Caribbean coast, and reading the new Lev Grossman book I just snagged a galley of on the beach, I can’t wait to eat Mexican food for every meal. 1. Chaya: A nutrient-packed Mexican cousin of spinach that should be appearing in my breakfast eggs. 2. Mayan food: I don’t know what pescatarian-friendly Mayan dishes will be available to me but have to believe that I’m in for a great dish or two from a cuisine with corn, tomatoes, beans, avocados, chocolate, and squash as its heady staples. 3. Romeritos: Dried shrimp patties, potatoes, and a rosemary-like wild plant for which the dish is named, served in mole sauce. (An e-gullet poster mentioned eating these while in the Yucatan, but the Wiki description identifies them as hailing from Mexico City, so I’m not sure if I’ll actually encounter them.) Doesn’t the romeritos plant looks like the lovechild of cactus and seaweed? 4. Salsa: I LOVE salsa. All salsa: rich, oily, roasted red chile-based salsas, in particular. And resent when pico de gallo – tasty in its own right but lacking depth of flavor – is made to masquerade as salsa. The pureed chile offerings are bound to be good here, and hopefully tasting so many different variations will be as fun as trying the various vinegary, garlicky ajis of Colombia. 5. 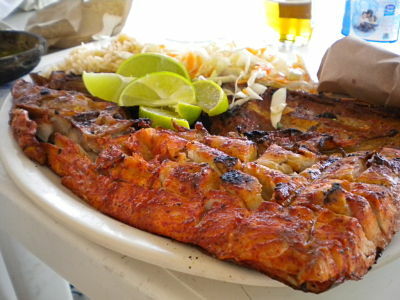 Tikin Xic – a whole white fish marinated in a mix of achiote paste (usually called annato in the US), pungent herb epazote, and juice from bitter oranges, then wrapped in a banana leaf and roasted or grilled. 6. Heirloom beans: I’ve read about lots of different kinds of beans and have had some trouble finding out which are available in the US and which are not. Different people have different takes on which beans are called what in Spanish and English and the mapping between the two seems uncertain, so I’m just on the lookout of something tasty and hopefully also new. 7. A tequila-like liquor made from the henequen plant, which is supposed to have the word Sisal on the bottle. (Thanks to Zora O’Neil, co-author of The Rough Guide to the Yucatan for this addition to the to-try list). 8. Fish tacos: I don’t care if these aren’t Yucatan-specific. They are Mexican and I will find and eat them and they will be delicious.